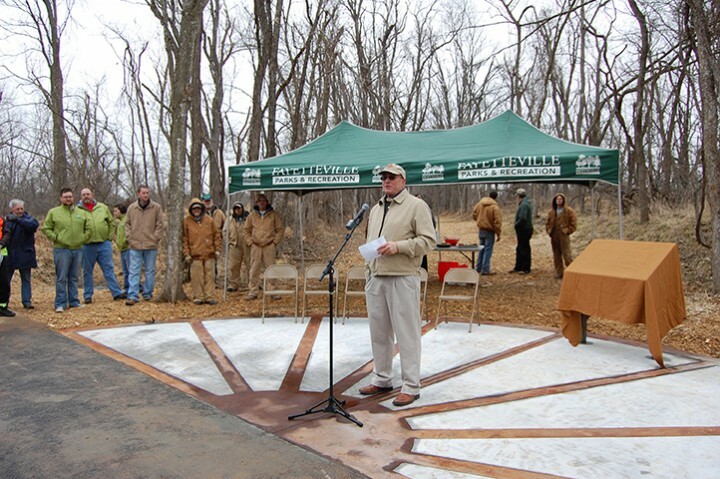 Heritage Trail Partners president John McLarty speaks at the dedication of a Butterfield Overland Mail historic marker on a spur trail of the Razorback Regional Greenway near Lake Fayetteville. The Razorback Regional Greenway was recently awarded a Henry Award at the Governor’s Conference on Tourism held in Springdale. The Greenway was presented the Natural State Award. This award is presented to a community, organization, special event or attraction which “stands out in the crowd” because of its unique appeal, media coverage, creative approach, and/or enhancement of community pride, thus benefiting the state’s quality of life. The Razorback Regional Greenway is a thirty-six-mile trail that stretches between Fayetteville and Lake Bella Vista through Johnson, Springdale, Lowell, Rogers, and Bentonville. The paved trail contains impressive bridges, follows along several creeks, runs through farmland and wooded areas, and connects to other trails, lakes, and parks. While the Greenway offers plenty of scenic beauty, it also links dozens of popular community destinations, including six downtown areas, arts and entertainment venues, restaurants, historic sites, playgrounds, and residential communities. Several Heritage Trail sites are on or near the Greenway. Explore the Greenway virtual tour and online map and chart your own course! The Henry Awards Ceremony began at the annual Governor’s Conference on Tourism in 1981 and has become an important part of this gathering of tourism leaders and one of the most prestigious tourism industry awards in Arkansas. Recognizing those individuals, businesses, and organizations which have distinguished themselves during the past year is now a tradition. The Henry Awards honor Henri de Tonti, the man historians consider to be one of the first “Arkansas Travelers.” An Italian adventurer, Tonti was a trusted friend and lieutenant of the French explorer Sieur de La Salle. After La Salle granted him extensive land and trading concessions in the lower Mississippi River Valley, Tonti sent several men in 1686 to build a trading post near the confluence of the Arkansas and Mississippi rivers. This “Poste de Arkansea,” as it was then called, or Arkansas Post, became the first permanent settlement in the lower Mississippi region and the first center of Arkansas hospitality for the people who passed that way.